Flying in international first class can be quite an amazing experience. 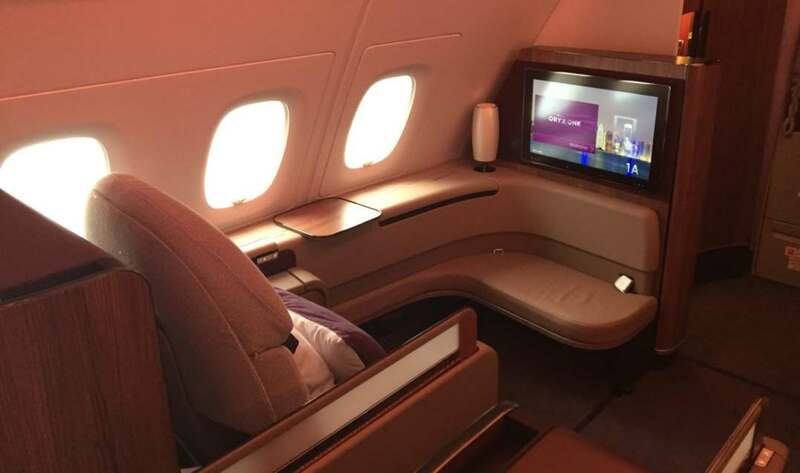 Booking these seats can be tough to do since more and more airlines are removing first class cabins from their planes and devaluations are increasing the costs of these premium seats. But given the opportunity, the experience of flying international first class is well worth the effort. Especially when you are celebrating an engagement. The only nonstop option was on Cathay Pacific. We flew Cathay last year and had a great experience, but as tempting as it was, we wanted to try out a new carrier. British Airways was an option going through London, but I ruled them out because I didn’t want to pay high fuel surcharges. 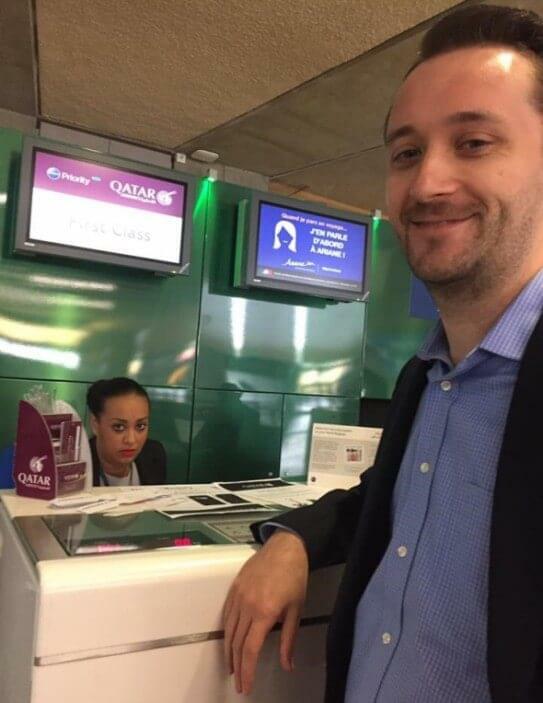 Another choice was to fly Qatar Airways via Doha. American normally doesn’t let you transit a third region on awards, but they make an exception on certain routes when flying through Qatar’s hub. This option became our top choice since Qatar flies their A380 on their CDG-DOH route. I used British Airways’ website to search for award space since American’s website won’t find award inventory for Qatar flights. Once I was able to confirm availability on the dates we needed, I called the AAdvantage desk to book, and I used my American Express Premier Rewards Gold Card (3X on airfare) to pay the taxes which came to roughly $101 per person. Done! Fast forward to our trip. We’d done quite a bit of traveling so far for the year, and we’d already flown in business and economy so far on this trip. But now it was time to be blown away. Qatar doesn’t offer ground service in Paris, so we had to arrange our own transportation to the airport and chose to take the convenient Roissybus. Once we arrived at the terminal, we made our way to the check-in counter, and found the first class line empty as only one of their flights each day offers a first class cabin. As you can see, I was all smiles but for whatever reason, the agent was not. The first class check-in line was emptyWe were given passes to visit the lounge designated for business and first class passengers. Qatar contracted the Salon Galaxy lounge, and although it was small, it wasn’t crowded so it ended up being fine. We found a quiet corner then visited the food and beverage area for a snack, but the options were fairly limited. This was a little disappointing, but I knew we’d have a great meal on our flight, so it was actually a good thing we didn’t eat too much ahead of time. We left in time for boarding which was set to begin an hour before our departure. Once we showed our boarding passes to the gate agent, we were pointed to the section of the jetway for first class and we were greeted with big smiles as we were shown to our seats. A few minutes later, a flight attendant asked if we’d like anything to drink, so we asked for champagne. Sadly, we were told none was available until we were airborne so we opted for water until takeoff. Qatar Airlines first class seatWe were impressed by the attractive Armani amenity kits. Mine featured some great Armani products including a small bottle of cologne to take with me. We were also presented dinner menus to peruse as we pushed back from the gate only a few minutes later. Our flight attendant passed by and poured us champagne and offered to take our dinner order. 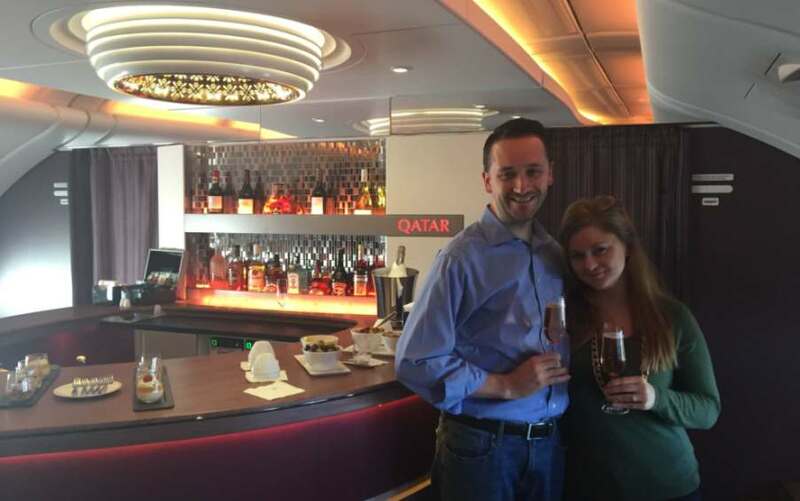 After choosing our courses, I told him we wanted to finish our champagne then go to the onboard bar for a few drinks, then come back for our meal. He cheerfully obliged. After we finished the bubbly at our seats, we walked through business class all the way to the back of the plane and found the gorgeous bar and an eager crew member ready to pour us some drinks. We decided to stick with champagne. The bar on Qatar was at the back of the planeThe bartender was awesome. Since no other passengers had yet to discover the bar, we got all his attention. He asked where we’re from, where we were going on vacation, and so on. We told him about our trip and also mentioned that we had gotten engaged the day before. He was very excited and congratulated us and insisted upon more champagne.After an hour, we decided to make our way back to our seats for dinner. We said goodbye to our new friend, and I promised him I’d be back after dinner for a nightcap since I had yet to sample the Johnny Walker Blue that I had been eyeing behind the bar. The flight was off to a great start, but there was still much, much more ahead.